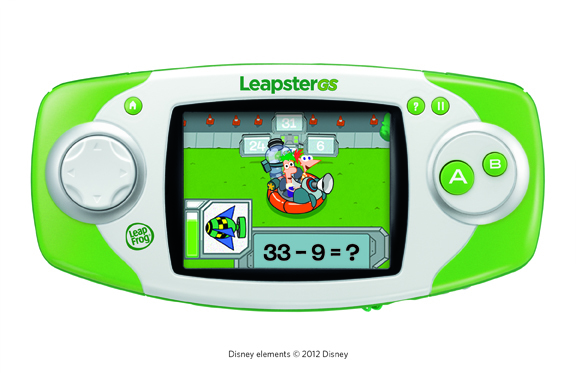 Leapfrog’s new Leapster GS, a handheld learning game system, is a revised version of the award-winning (including 2011 Toy of the Year) Leapster Explorer. It offers a thinner design, larger screen, 2GB of internal memory, built in camera /video recorder/motion sensor/microphone and a faster processor. Lucia went bonkers last week, when she stepped outside to discover that LeapFrog sent us a Leapster GS, several preloaded apps and two game cartridges. I am a big LeapFrog fan – their educational component keeps bringing me back. With that being said, we are also a family that limits screen time – since our kids are the type that seriously vegetate in front of screens. As a result, we are particular about what sorts of gaming devices enter our home. Lucia (now four-and-a-half) received a Leapster Explorer for Christmas and has shown that she responds well to toy specific learning. Since she has enjoyed her Leapster Explorer so much, I could not wait to have her try out the new Leapster GS. Lucia was most excited about the built-in camera and video recorder. She has been asking for a camera, and has had so much fun taking photos and videos (just like mama!). Lucia can easily access her work in a central location called “my stuff”. She is even able to edit her masterpieces (draw, add audio, create albums) and share them with her friends! Lucia capturing her favorite subject on film. Lucia can turn on the device and select her profile and game without my assistance. Her current favorite game is a free app called “Escape of The Sillies”, in which she’s able to become a silly monster character, by adding her own picture and recording her voice in the “silly lab”. The game cultivates math skills, while face-morphing technology entertains as she is literally the face (and voice) of all the characters. The game captures live video of our surroundings (via the back-facing camera) in which the silly monster characters play. As a parent, the educational content is what gets me excited. I am pleased with many of the apps and cartridges because they work on building valuable skills in reading, writing, science, math, technology, engineering and logic. Most importantly, they are entertaining enough to hold my daughter’s interest. I appreciate that the learning curve can always be adjusted. Harder questions are introduced, and the games also reduce difficulty levels if the device senses that it is necessary to do so. In addition, I can manually adjust the difficulty level and track my child’s progress online. The Leapster GS is marketed for ages four through nine, but Adrian (age two) has also enjoyed using it with our guidance. I honestly think that this is a device that younger children can grow into. All of the buttons are very easy to press. Adrian proudly holds the stylus correctly and can even trace the first letter of his name in the “Pet Pad” app. In this game, he can wash his pet without our help and feed his pet with the assistance of his sister. I can not recommend the Leapster GS enough and imagine that it will be a giant hit this year. Best of all, it is newly available to order! I was given a Leapster GS, several apps and two cartridges for the purpose of review. LeapFrog in no way influenced this review and all opinions are 100% my own. What a great idea! My toddler would LOVE this and I have an Amazon giftcard… so it was meant to be! Cool! It's currently in stock on Amazon now too. Lucia looks like she's getting her learning on! Wow! A motion sensor and a microphone too! I love this for my kids. Thanks for sharing. I bet my boys would love this, thanks for the idea! My husband and I were just having this discussion! It's so amazing to me that my daughter was just adding audio and colors to a photograph that she took today on this device. This sounds great, Monica! I know Julia would love it, but am also thinking of purchasing it for school. Some of our students have benefited so much from short videos and this seems like it would be a very age appropriate device to deliver that information to them. Thank you! Thanks so much for you comment Michele, it's great that you think that this could benefit your students. My kids are still loving their Leapster GS.